Captain R.E. Partridge’s Coy. 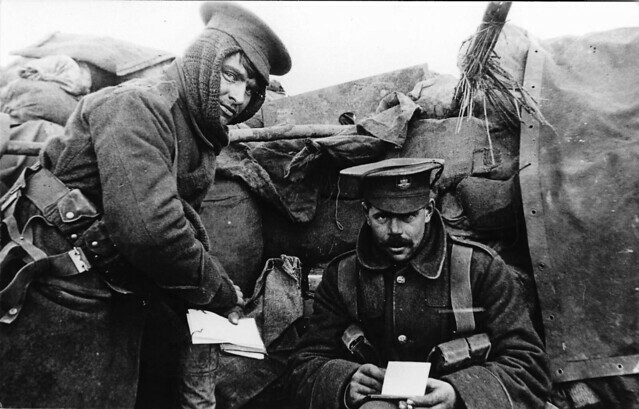 Orderlies (D Company), in trenches opposite Wychaete in November, writing letters home. This remarkable photograph, taken by Captain R.E. Partridge (our goose hunter from a month ago), shows two sergeants in D Company of the Dorsets. If the date on the photograph is right then it must have been taken between the 26th and the 30th November 1914. You can see from the clutter behind them how temporary the trenches were at this time, with tarpaulin slung over sandbags as breastworks. It’s remarkable because personal photography was very much frowned upon by the BEF who banned cameras from Christmas 1914. Thankfully for us, this rule was flouted and there’s an interesting collection of personal photos available to look at on the Guardian website. Conversely, the Germans encouraged photography. There was a great documentary on BBC4 a while back called Hidden Histories: WW1’s Forgotten Photographs which focussed on the photographs of Walter Kleinfeldt. They remind me of the incredible American Civil War photographs by Mathew Brady. The Dorsets came to the conclusion that the German trenches were strongly held. Perhaps they had sent out a patrol in the night which would explain the outburst of rifle fire recorded yesterday. But no mention of this is made in the Dorsets’ dairy so perhaps they made simply an informed assumption about the enemy’s strength. Rather abruptly, the Dorsets began to be relieved from 5.30pm by the Royal Scots Fusiliers and a Company of the Bedfords who took over part of the right hand of their line. The relief was finished by 11.30pm whereupon the battalion returned to billets in Dranoutre. This would refute my assumption in the text that they were sergeants.